From an article by David Goulden, Leitrim Observer 22 July 2011, with thanks to George Hook. 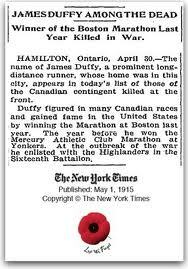 Jimmy McNiff/Duffy (born May 1, 1890, Sligo to James and Mary Duffy from Innishmagrath, Drumkeerin Co Leitrim; died April 23, 1915, outside Ypres, Belgium) eventually ran for Canada, his adopted country, and was the winner of the 1914 Boston Marathon. 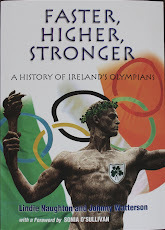 Although born in Ireland, Duffy had grown up in Edinburgh, Scotland, where he ran with Edinburgh Harriers and trained as a tinsmith and stonecutter. While in Scotland, he won the 1909 Scottish junior cross-country title and set a Scottish 5-mile record of 25 mins 52 secs. He also represented Scotland three times at the international cross-country championships. In 1911 he emigrated to Canada, lured by the active professional running scene in that country. He settled in Toronto, working as a porter at a large department store and joining the Central Young Men's Christian Association. Duffy placed fifth in the marathon behind Kennedy McCarthy from Dervock Co Antrim in a time of 2 hrs 42 mins 18 secs. In October 1912 he won both the Ward Marathon and the Hamilton Herald Marathon in Ontario, setting a course record of 1 hr 46 mins 15 secs that stood for 46 years. With Tommy Thomson as trainer, Duffy stayed in Hamilton and went on to win seven consecutive marathons, including the 1913 Yonkers Marathon and the Ward Marathon for a second year. On April 20, 1914, Duffy won the Boston Marathon in 2:25:1, beating fellew Canadian Edouard Fabre by 15 seconds. His first request after his victory was for a cigarette and after his post-race medical examination, he asked for a bottle of beer. After Boston, Duffy turned professional, but ran only one professional race, which he lost to Fabre before enlisting in the Canadian Army at the outbreak of World War I. He joined the 91st Argyle Regiment and was subsequently transferred to the 16th Battalion of the Canadian Expeditionary Force, arriving in Belgium late in 1914. He was killed, aged 25, on April 23, 1915 when hit by a piece of German shrapnel near Ypres, Belgium. He is buried in Vlamertinghe Military Cemetery, Plot 1, Row F. His name is inscribed on the Menin Gates in Ypres, along with that of 54.896 other fallen soldiers.